Dress, Anthropologie. Burgundy sweater, Boden (20% off with code 2F5Z). Bag, Rebecca Minkoff (on sale!). Yellow-and-beige sweater, Boden (20% off with code 2F5Z). Burgundy faux-leather skirt, J.Crew (use code SHOPMORE for 30% off a $200 purchase or 25% off $125). Sunglasses, Illesteva (on sale!). Sneakers, New Balance. 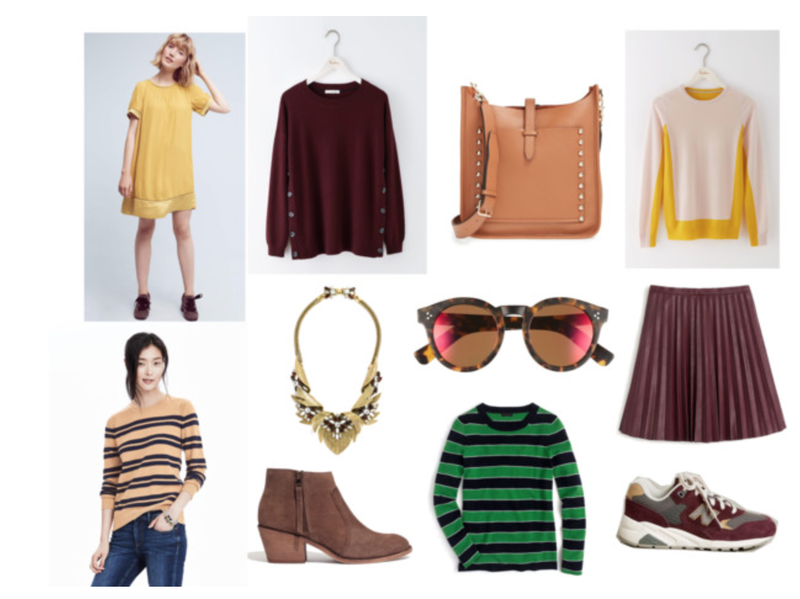 Green-striped sweater, J.Crew (30% off with code SHOPMORE). Booties, Madewell (30% off with code DOUBLEUP). Necklace, Baublebar. Camel-and-black striped sweater, Banana Republic. • This yellow dress! I love it with bare legs and booties now; it would be super cute with tights and a cardigan once the weather gets colder. • Sweaters. I live in them in the fall and winter. Right now, I've got my eye on this cute button sweater, this cool colorblock, this camel-and-black striped sweater, and this green-striped one. • Necklace. This one is so cool. It looks just like Lulu Frost--but costs under $50! • Fall-ready shoes. These Madewell booties kind of remind me of my all-time favorite Rag & Bone Newbury boots. But they a) are way less expensive, and b) have a much lower heel so they'll be much more comfy. And these sneakers are plaid! How cool, right? Need. I have been seeing those pleated skirts a lot... I need to grab one! I did snag a new sweatshirt already, but I am still not wanting summer to go away :( I need a new fall/winter purse REALLY bad though. Keeping my eyes open for something cute! I'm so excited about adding some new sweaters to my wardrobe. Fall is seriously my favorite season besides Winter.